Last weekend, Rina, my brother, my cousin Neil and I trooped over to Eastwood so I could finally watch The Avengers. A movie like The Avengers is something that I would normally watch on the first showing of the first day, however since Rain's Yaya hasn't isn't back from her vacation, we had to nix that idea (Word of advice: In the future, check movie schedules before allowing your daughter's Yaya to go on leave). I wanted to make it a special, relaxing experience for Rina because she's been so stressed out at work and taking care of Rain by herself while I'm at work, so I got her tickets to the Ultra Theater, which is famous for it's comfortable Lazy Boy Chairs. Since it was a blockbuster movie, we got there by 10:30am to get the tickets for the 2:30pm showing, which gave us enough time to eat and go around the mall without feeling rushed. 2:20pm came along and we made our way to the Ultra Cinema Lobby, only to find out that the cinema kept going through power fluctuations, so they cancelled our viewing. If we wanted to watch, they would give us a refund but we would have to line up once again to get new seats at the other Eastwood mall..defeating the purpose of going to the mall at 10:30am. we ended up missing the 3:30pm showing, and had to wait for the next one at 5:30pm. As you can imagine, I was pissed off. What was supposed to be a relaxing day out for Rina turned into us walking around the mall for seven hours just to wait for a movie! Whilst we were waiting for the 5:30pm showing, Rina found out that the international Ice Cream Parlor, "Swensen's" was having their soft opening that day as well. Since I was in a serious need of "cooling off', I thought with how I was feeling, some Ice cream would be absolutely perfect. 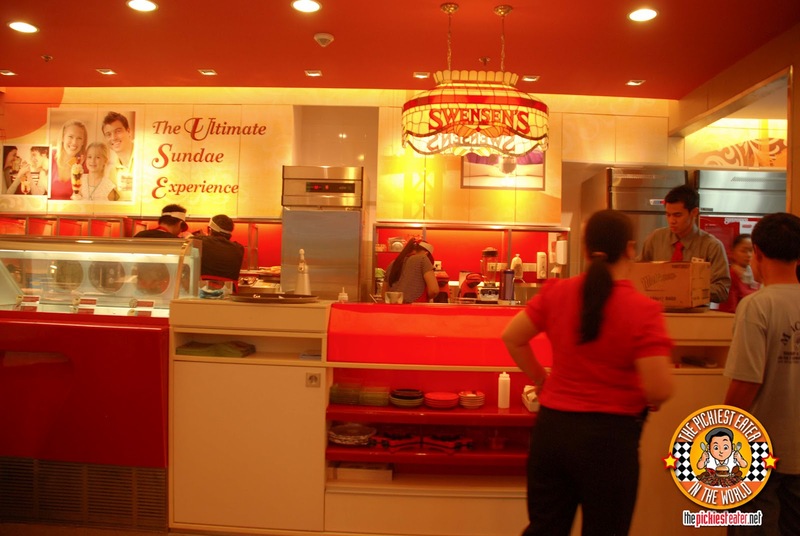 I had first seen Swensen's during my trip to Bangkok 5 years ago. Though It immediately got my attention, I unfortunately didn't get to try it. When I found out that they opened a branch in Mall of Asia, I added it to my list of places to try. But with Mall of Asia being a bit out of paper route, I never did get a chance to go. A couple of months ago, I saw a billboard in C-5 announcing that they'd be opening a branch in Eastwood, so I decided that I'd wait for that to open, as it's far more convenient for me than Pasay. 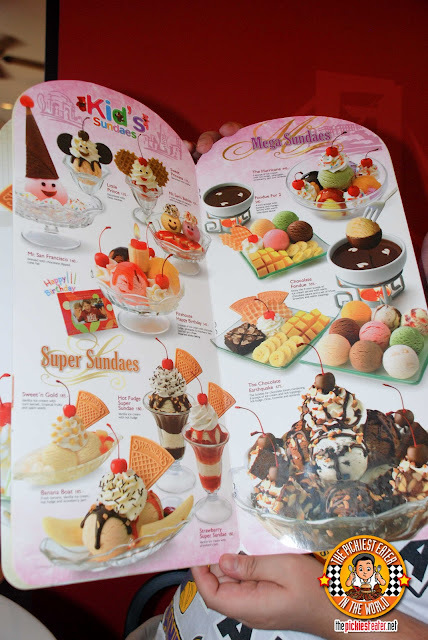 The allure of Swensen's to me, was that it reminded me of this Ice Cream Parlor in Hawaii that my mom would take me to when I was a kid, called "Farrell's". 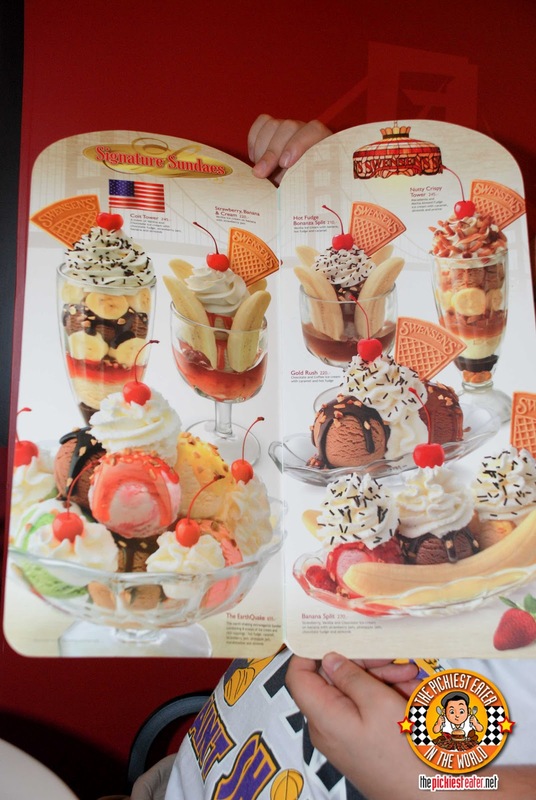 She would take my brother and I for a pizza, and then we would go for a huge sundae of our choice. Swensen's doesn't have the pizza or other food items, but what it does have, is a wide array of ice cream concoctions. Exactly what a hothead like me needed at the moment. 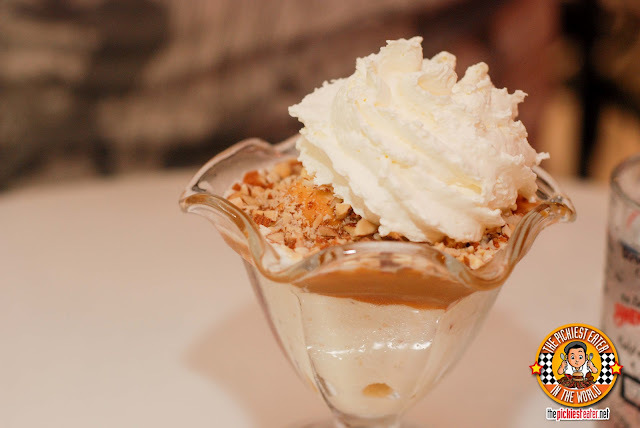 My brother created his own sundae by ordering a scoop of Macadamia ice cream, and asked them to add Whipped Cream, Almonds and Crushed Almonds. The Macadamia ice cream was wonderfully creamy, and was enhanced even further by the whipped cream. Personally, I wouldn't have added the almonds anymore because I'm not too big on nuts, and the ice cream already had macadamia in it. Nevertheless it was pretty awesome. 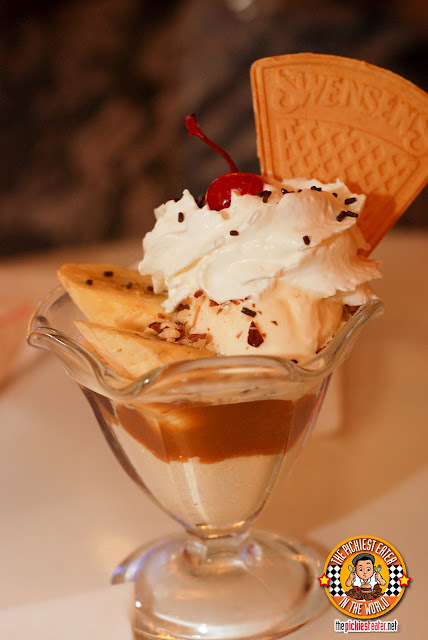 I ordered the Hot Fudge Bonus (P140), which was Vanilla Ice Cream topped off with whipped cream, bananas, caramel, chocolate sprinkles, and a small piece of wafer cone. not too sure what was so hot fudge about it, especially since they used caramel instead of chocolate. Nevertheless, taking into consideration the heat and my temper, this hit the spot! My darling Rina once again proved that she truly is my soulmate when she ordered the Coit Tower (P245). 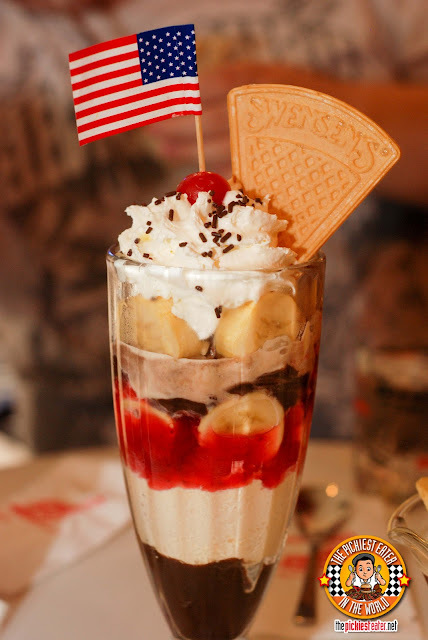 The behemoth parfait was filled to the brim with whipped cream, bananas, Hot fudge, strawberry sauce, Chocolate and Vanilla ice cream. Despite the daunting size, my pint size wife took this down just like how David slew Goliath (but without the slingshot). 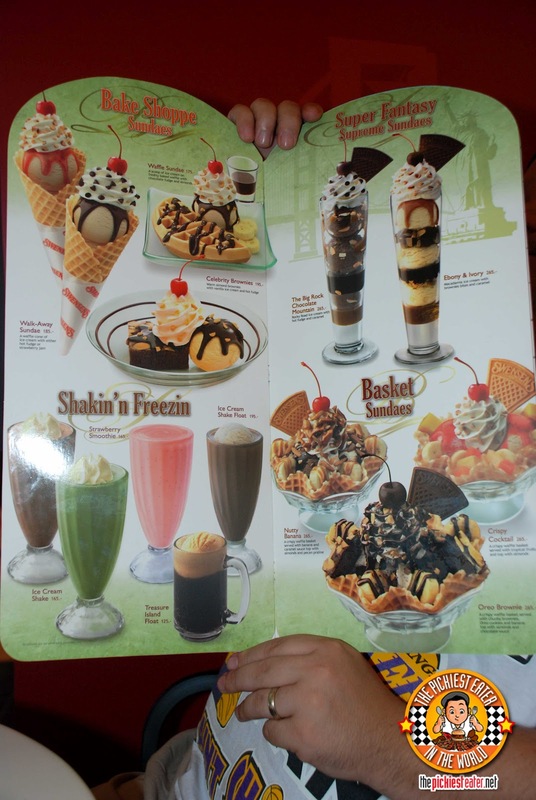 Swensen's offers long list of different Sundaes, parfaits, floats and shakes, and based on their menu, they have at least 27 flavors to choose from. 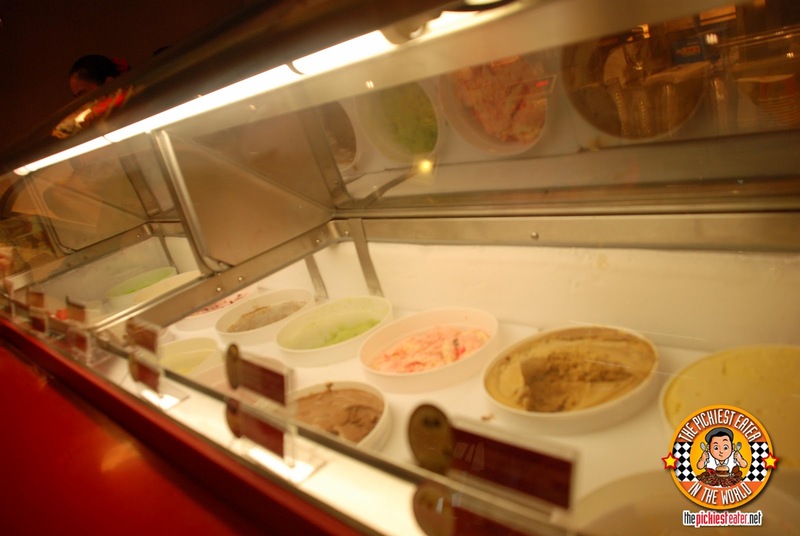 The one that I'd like to go back for a single scoop (P90) would definitely be the Strawberry, Banana N' Cream, Reversible Chocolate, and the Almond Praline Delight. 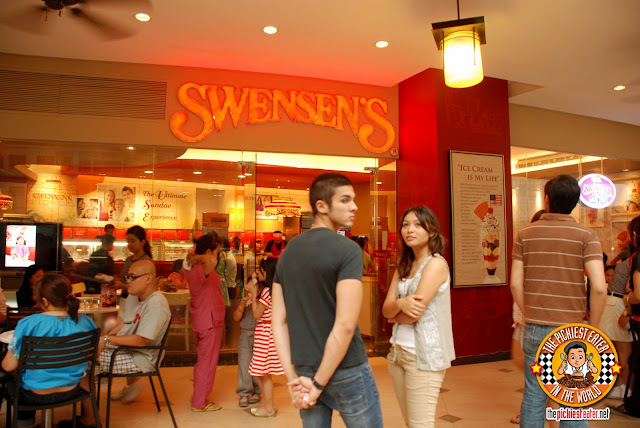 Since it was the soft opening, Swensen's had some promo girls walking around to play some games. From afar, I thought that the girl with pink hair was the blogger known as The Purple Doll. As I got nearer, I realized it wasn't her. Funny story, When I asked to get a picture with two of the promo girls (albeit the less attractive ones, to put it nicely, but they were the only ones there at that time), one of the girls actually walked out in the middle of the picture, while other one gave the camera a smile that made her look constipated (I'm serious, you should see the picture!). 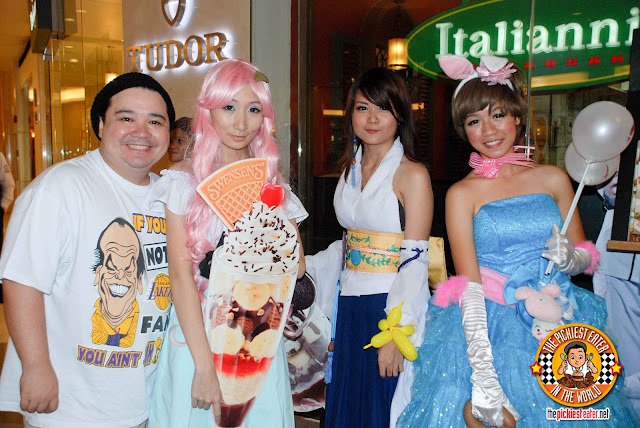 Easily the crappiest Promo girls I had ever seen, especially since their jobs is based on enticing people to go to Swensens'. They acted like they didn't want to be there. Luckily I bumped into these three ladies, and they gamely smiled for the Camera. Although I'm not too sure what their costumes have to do with Swensens', I just thought it would make for a nice picture. 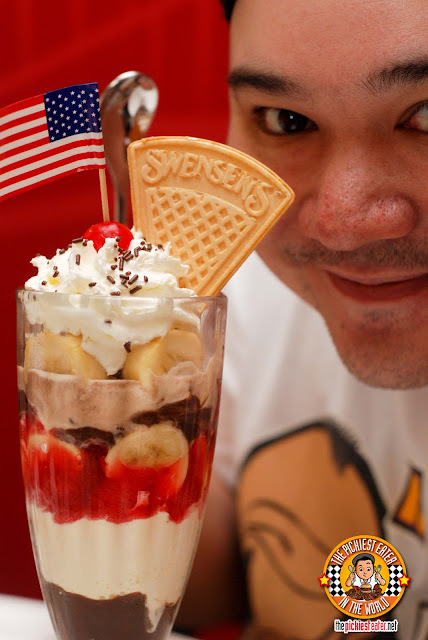 I wouldn't hesitate to go back to Swensens' especially since I want to try their other creations, including the Chocolate Fondue. My only problem is, given the weather recently, the ice cream melts too quickly. 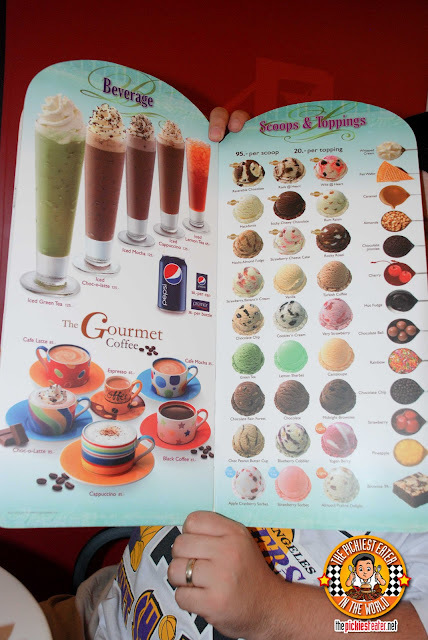 Other than that, It's definitely a fantastic ice cream parlor that one must experience! haha sige i'll email it to you! funny you thought one of the girls was sumi! haha! :) haven't tried swensens yet.. reminds me of the magnolia house in aurora blvd before. oh-my-geez!! 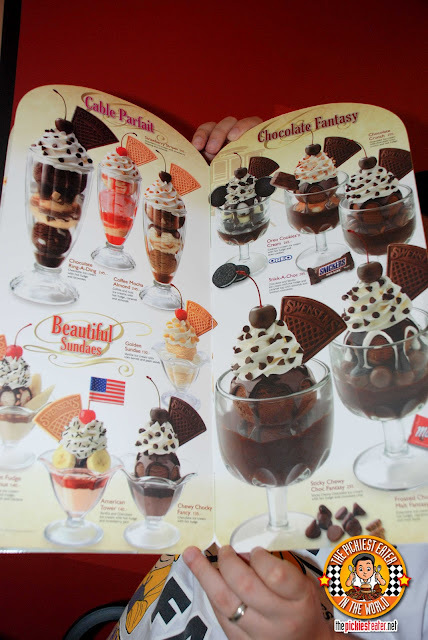 i wanna try the chocolate fantasy ice creams, the fondue and those w/ waffles!! I wanna go back for those too! haha it's true! you should see the picture!! LECHON LOVE AT CEBU'S ZUBUCHON! IT'S OFF TO GRAMS DINER WE GO!